Well, it’s snowing here in NY (AGAIN!). Sigh. We just hope my kids get their midterms in and don’t have it dragging out over the weekend. On a brighter note, I found the perfect book for a snowy day. It’s a fun read and totally inspires you to unleash your inner cook. 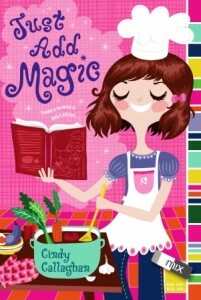 Read on to learn more about Just Add Magic and its author, Cindy Callaghan. AND….as a special hope-you’re-not-snowed-in, but here’s-something-to-cheer-you-up-if-you-are incentive, comment at the end of this post and tell us your favorite thing to cook. The winner will be drawn in one week and will win a signed copy of Just Add Magic. Don’t forget to leave your e-mail address so I can contact you. Could these recipes really be magical? Who wrote them and where did they come from? And most importantly, what kind of trouble are the girls stirring up for themselves? Things are about to get just a little too hot in Kelly Quinn’s kitchen. Just Add Magic is Cindy Callaghan’s debut novel. 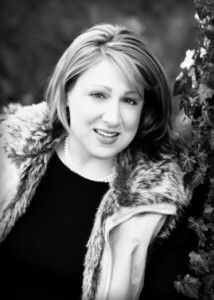 Cindy grew up in New Jersey and attended college at the University of Southern California before earning her BA and MBA from the University of Delaware. Her full-time job is in corporate America; her other full-time jobs are mom and writer. She is very involved with her children’s activities, including coaching the occasional soccer team.Â Cindy lives, works and writes in Wilmington, Delaware with her family and numerous rescued pets. 1. In Just Add Magic, you center the book around food. Are you a big cook? And did you have to do a lot of research (i.e. cooking and eating!) while writing? I am not a good cook.Â I can admit it.Â And I donâ€™t really like to cook when I have to.Â I like to cook for fun.Â For example, I donâ€™t make very good pancakes (instant kinda stuff), but I make them pink, purple, blueâ€¦whatever color I feel like that day.Â The hardest part about the recipes for JUST ADD MAGIC is that I donâ€™t follow them.Â I just have an idea for how much seems about right.Â Then, I taste test.Â Usually Iâ€™m pretty close, but sometimes itâ€™s disastrous and I order pizza to be delivered. I do like to bake.Â I toss in a little of thisâ€¦some of thatâ€¦and oh yumm. 2.Â Â Â What’s the nicest thing someone has said about the book? There has been so much.Â The feedback has been amazing both from adults who have read it and kids too.Â I love, love, love going to pick my kids up from school and the other children run up to me with a copy of the book to sign.Â I feel famous. I think I am most impressed/flattered when someone takes the time to write me an email after theyâ€™ve read the book.Â A few times a week I get a note from a tween who has read it and they tell me how much they loved it.Â Thatâ€™s what it was always all about for meâ€¦.giving a reader something they can just fall in love with. 3.Â Â Â Have you gotten any letters or reader reactions that surprised you? Someone recently wanted me to send them an autographed picture of me.Â I thought, â€œIâ€™ve arrived!â€Â Then I thought, â€œI donâ€™t have any autographed pictures of myself.â€Â My next call was to 1-800-DAD who printed some shots for me to sign. 4.Â Â Â Where did you grow up? When you were 12, what did you want to be when you grew up? I grew up in New Jersey and did my first few years of undergraduate studies in LA.Â I wanted to be a celebrity, a movie star, maybe have my own talk show.Â I still think I would make an absolutely amazing TV Detective.Â It wouldnâ€™t surprise me to get a call from Law and Order or CSI one of these days. 6. Â Besides writing, what do you do to fill your days? I have a full time job as a marketer in the pharmaceutical industry, very polar opposite to my writing job.Â I also have three busy kids and I try to be very involved with all their sports, clubs, activities and friends.Â This provides me with tons of good material to write about. Besides that I love going to the mountains, reading, watching crime drama, walking, going to the movies and hanging with my pets and friends. 7.Â Â Â If I told you tonight’s dinner was your last meal ever, what would you request? (appetizer, main course, dessert). Cindy has a really fun website–complete with recipes. Go visit and say hi. And don’t forget to comment to win a free book. And what the heck–include a recipe and we’ll count your entry twice. Preheat oven to 325 degrees. Line a 9×13 pan with foil and spray foil with cooking spray. While the crust is baking, prepare the filling. In a large bowl mix together the eggs, corn syrup, white sugar, butter, and vanilla until smooth. Stir in the chopped pecans. Spread the filling evenly over the crust as soon as it comes out of the oven. Bake for 20- 25 minutes in the preheated oven, or until set. Allow to cool completely on a wire rack before slicing into bars. Mix all of the above together. Then place in two 9 inch pie crusts. Thanks for a cheery website! My favorite thing in the kitchen is baking…bread, pies, cakes cookies…it feels good doing it, it smells great in the oven and it tastes even better when it comes out warm! 1. Warm the milk in a small saucepan until it bubbles, then remove from heat. Mix in the butter; stir until melted. Add water and let cool until lukewarm. 2. In a large bowl, combine the milk mixture, yeast, white sugar, salt, eggs and 2 cups flour; stir well to combine. Stir in the remaining flour, 1/2 cup at a time, beating well after each addition. When the dough has pulled together, turn it out onto a lightly floured surface and knead until smooth and elastic, about 8 minutes. 3. Divide dough into two pieces. Roll each piece into a 12×9 inch rectangle. In a bowl, stir together the cinnamon and brown sugar. Spread each piece with half of the butter, half of the brown sugar and cinnamon mixture. Roll up dough, using a little water to seal the seam. 4. Cut each roll into 12 slices using a very sharp knife or dental floss. Place rolls onto two 9×13 inch greased baking pans. Cover and let rise until almost doubled, about 1 hour. Meanwhile, preheat oven to 375 degrees F (190 degrees C). 5. Bake in preheated oven for 20 to 25 minutes until golden brown. 6. To make frosting; combine confectioner’s sugar, cream cheese, butter and vanilla. Add milk gradually until frosting reaches a spreading consistency. Spread over warm (but not hot) cinnamon rolls. To cut down on spam, please confirm that you are not a robot by entering the correct number below.